Based at our purpose built clinic near Kilmington we aim to provide the veterinary service you and your pet deserve; from the most miniature Shetland to the biggest shire. Good value with a focus on your individual needs. We’ll advise you on the options but the decision is always yours. Most of our examinations will be at your home or yard and each vet carries a wide range of equipment and medications to deal with routine and emergency situations. The in-clinic facilities allow for more detailed investigations, advanced treatments or simply control of a recalcitrant patient in the stocks. Advanced dentistry techniques including tooth extraction, occlusal surface restoration and bridging techniques to treat periodontal disease. With 4 dedicated equine vets we aim to tailor our services to suit you. 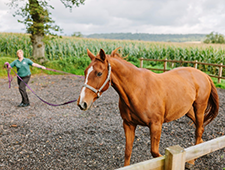 No two patients or clients are the same and we feel it is essential that the treatment you receive is the one best suited to you and your horse’s needs.